When we read the stories about Enron, HealthSouth, and other accounting scandals, what is usually mentioned is the malicious intent of the executives to perpetrate a fraud. This is because “bad people do bad things,” right? Although the stories are instructive of how things can go wrong in an organization and how it can affect those involved, it is easy to forget about how we are all susceptible to the same temptations. 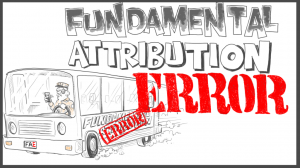 The fundamental attribution error is the human tendency to attribute the cause of these wrongdoings to the character of the individual who committed them. It’s called an error because, overwhelmingly, human behavior is determined more by environment than inherent personality traits. This error of perception works both ways, too: when something goes right, we tend to think that it was due to our virtues and/or skills rather than external factors (sheer luck, a good supporting staff who helped along the way, or a stock-market generally on an uptick). This, combined with the fact that people tend to rate their ethical inclinations higher than they actually are, is a troublesome sign for working professionals in just about every field. A fraud can begin with an innocent mistake, and continue because the perpetrator needs to cover it up. Of course, this is because they do not believe themselves to be a bad person. However, being aware of the problem is an important step toward preventing future unethical behavior. That accountants spend a great deal of time thinking about internal control perhaps serves as a tribute to this way of thinking. We restrict access and separate duties of employees in a manner that reflects the notion that environmental factors are strong determinants of behavior. Surely these companies do not go around hiring bad people all the time so that they feel the need to exercise constant vigilance. These employees go along with it without feeling as though they are distrusted because the company thinks they are bad people and thus likely to steal from them. It is an unfortunate fact of life, but you can put an otherwise good person in a position where they can commit fraud without oversight or control, and you will run the risk of a fraud occurring. For more about the psychological aspects of ethics, see Ethical Decision Making: More Needed Than Good Intentions and the Ethics Unwrapped Series, both by Robert Prentice, McCombs School of Business.